1985 was the year that UK film admissions were at their lowest, and David Puttman instigated a British Film Year. 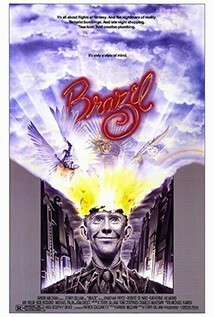 Our 1985 programme reflected a strong British programme of over 26 films, new and old, including Terry Gilliam’s startling original ‘Brazil’ (1985). In 1982/3 we changed to Chichester City Film society and received the first of many Film society Awards. – Roger Gibson. In the future, a clerk (Jonathan Pryce) at the all-powerful Ministry of Information sticks to his ideals and ends up crushed by the system in this half comedy, half horror story from former 'Monty Python' animator Terry Gilliam. Like Orwell's novel '1984', which it echoes, the future is seen from a 1940's perspective. Jonathan Pryce stars, with Robert De Niro making a cameo appearance as an excessively diligent sewage inspector! Controversial and misunderstood on its initial 1985 release and visually stunning, this Kafkaesque film is an underrated classic partly written by Tom Stoppard, and is now ripe for revaluation. The large supporting cast includes Ian Holm, Bob Hoskins, Katherine Helmond, Michael Palin, Jim Broadbent and Ian Richardson.